I recently finished combing through my old blog posts and my build thread on Zilvia since I began this journey, fixing broken image links that have popped up over the years. Unfortunately I used to rely heavily on Image Shack, which I believe is now more or less defunct, causing the majority of my image links to be broken. Thankfully, I had taken the time a few years ago to save most of the images from my build thread that were hosted there thinking this might happen one day. Some of them are low resolution and a few were lost all together, but I am glad I decided to do that. It was a tedious process and few people will probably even notice or appreciate this task, but I felt it was important to try to preserve the journey with my 240SX for as long as possible. With the sale of Yahoo! to Comcast recently, I’m sure Flickr could one day meet a similar fate- but hopefully things will be OK for a while. I try to enjoy each day with what little new content is still posted on Zilvia.net knowing that the rise of social media has all but killed it and it too will one day cease to exist. Looking back on all of the old tales of my time with this car has made me so appreciative of the fact that it is still sitting in my garage. November of this year will mark the end of my seventh year with this car, nine years since purchasing it during my last semester of college, with a two year gap in time where I had sold the chassis to a friend. It’s funny to look at how my life has changed over the course of those nine years, having transitioned from a kid in his last semester of college with an internship and a fiancé to a husband, homeowner, and soon to be a father of three daughters. The car scene is sort of a funny thing when you really step back and think about it. It’s a group of people spending tons of money and time on something that is completely optional and unnecessary. The average person could never fathom spending what we do to essentially ruin a car- and they’re totally right for thinking that way. I’ve wasted so much time and money on this junky old Nissan over the years, but when I look at the big picture I don’t think I would change much of what I have been through. The friends I have made and the experiences gained along the way are largely worth it, as cliché as it may be. It’s difficult these days not to get caught up in it all. I routinely see the younger generation getting themselves into trouble by trying to be the best. Everyone wants to be famous on social media and to stay in the limelight, and I would be lying if I said I never felt the same way. I initially set out to build a clean representation of what I felt a perfect 240SX should look like- and for the most part I set out to do that for myself. I never imagined that my car would gain any sort of attention or end up on the cover of a magazine, because to me everything had already been done. I wasn’t in it for notoriety at the start, I was simply in it to do something I enjoyed and try to build a car that felt like a reflection of myself- to learn through doing and to feel a sense of accomplishment. I’ve always strived to be humble and never let any sort of attention my car got go to my head. I can’t say I have always been successful at it, but it was always important to me to help people that had questions and inject a positive attitude into this hobby. In the age of the internet, there is so much hate and negativity out there. Every time you post something, you’re opening the floodgates to an onslaught of critique, be it negative or positive. There were times where people broke me during the process and I allowed myself to sling a few insults. No one is perfect, but I’ve always wanted to remain positive and motivate the people around me, just as many of them have done for me over the years. I had my time of wanting to be the best and letting the attention go to my head. I think at the end of 2011 and into 2012 is when my build went a bit in this direction. I felt that I had entered the limelight a bit in the S chassis scene, and the more attention I got the more I craved. I took my car in a direction that pleased others more than it did myself, and it ultimately made me lose interest. The sizing of my Blitz 03s was too aggressive, the ride height was too low, and my car lost its drivability. I think it more or less became an internet car and it made me unhappy with it. It wasn’t about driving and enjoying the car anymore, it was about having the parts that no one else had and trying to achieve perfection in the eyes of others- something that isn’t possible. The combination of this feeling and the public perception that you can’t own a project car and raise a family ultimately led me to parting out the car in 2012. 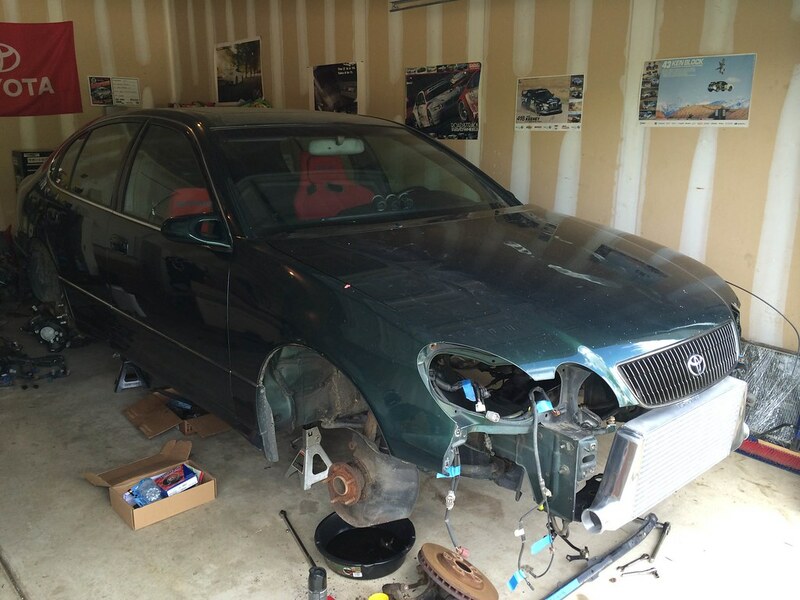 During my time away from the 240SX, I tried to let go of seeking affirmation through a project car. I picked up my Evo as a daily driver that would allow me to bring my family with me and still enjoy tinkering with a car. 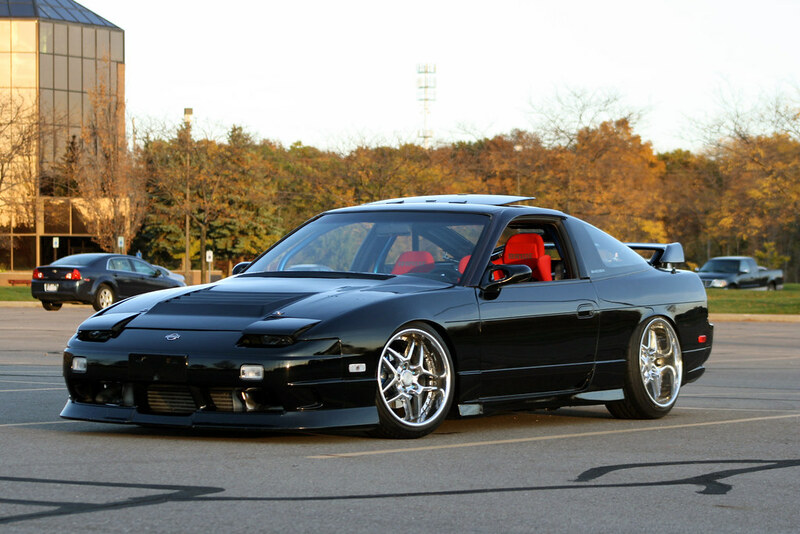 I set out with the same formula I did for the S13 from the beginning- simple modifications that would keep the car streetable and clean, resulting in a reflection of what I felt was the perfect CT9A. I achieved this vision sooner than I anticipated, and immediately became a bit bored. Though it was clean and more or less perfect to me, the Evo was fairly basic. I eventually caved and got suckered into a full Voltex aero package that was pricey and overkill for the street. It was difficult to drive the car every day without a beater as a backup, and it was an expensive chassis to begin with. The more miles I added, the less valuable the car became. The Evo felt largely like a lose-lose situation. Not only was daily driving a car like this becoming a bit of an issue, but I also missed the build process. I genuinely missed spending late nights in the garage turning wrenches to create something from nothing. The Evo project was more of an every day car with quick weekend install sessions- being that it was my only means of transportation, I had to have it back together for work on Monday morning. Building the S13 was much more rewarding as I could take my time to really dive in and learn about the vehicle. I was under the impression that I would no longer have time for anything like this with a little one at home, but even with my wife pregnant with our second daughter, I felt I could spend time on a dedicated build again if I was willing to sacrifice a little sleep in the process. Things wouldn’t get done as quickly as they used to, but it was definitely still possible. Looking back at it all now, I realize that it wasn’t another project I wanted- it was my 240SX. 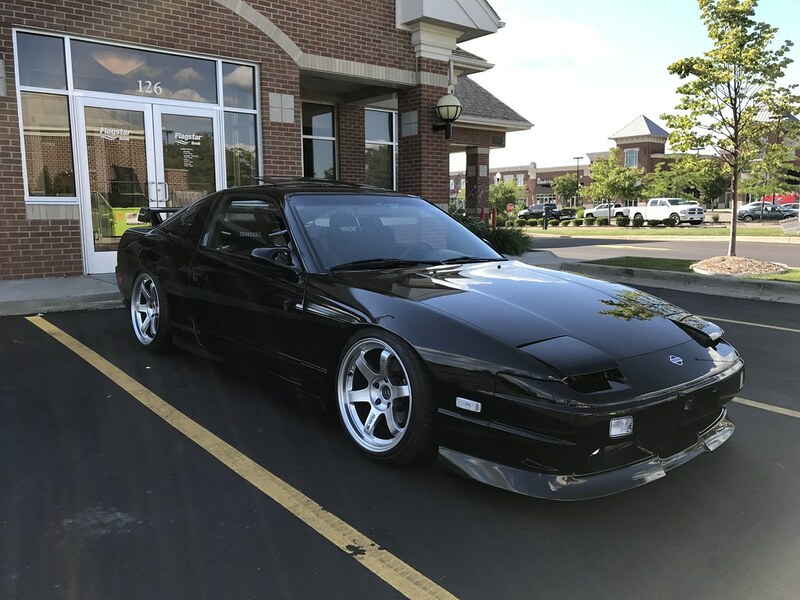 I actually talked to a guy in Florida that was selling a mostly stock black 1993 S13 at the time, but he wanted a bit too much for it. 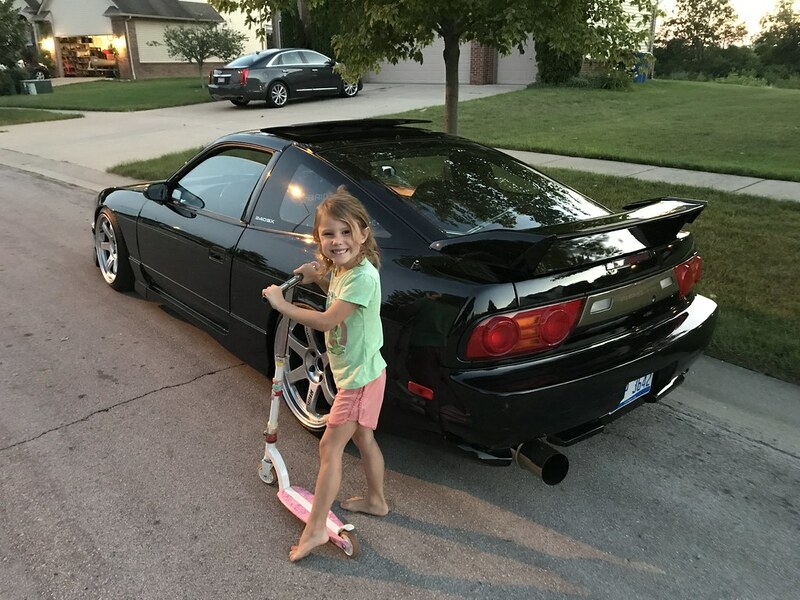 I also felt like my wife might kill me if I brought home another 240SX, essentially recreating what I had done previously. The 98 Lexus GS400 felt like a good compromise at the time- I would be able to haul all of us in it, but swapping a 2JZGTE and converting the car to a manual transmission would be a fun and unique process. I began my car hobby wrenching on Toyotas, and I liked the challenge of returning to a platform with little community and aftermarket support. I talked myself into it being a good idea, probably knowing in the back of my head that my S13 was what I really wanted back. While the Lexus project kept me plenty busy, it was a bit doomed from the start. 2JZ engine and transmission components are much more expensive than SR20DET parts, and a bit more complicated to boot. I saved a lot of money by buying a shell instead of a running car, but that was my first mistake. Starting with a car I had never driven made it difficult to stay motivated, and it felt like I would never be able to get it running. The color of the car was not what I wanted, nor was the condition. I settled because I was too eager to get working on a project. Though I had started with a modification list and a budget in mind, I quickly found that it was not possible to build what I wanted to with the budget allotted. I was running low on funds and the car didn’t even run yet- not to mention the fact that I hadn’t purchased aero, wheels and tires, or paint work yet. The build began to stress me out as I knew I was getting sucked into spending way more than I should be and it was causing tension with my wife and I. I got “lost in the sauce” so to speak and was striving for affirmation from my peers. In a way, I put trying to be the best at my hobby ahead of my own family. Eventually, things came to a breaking point. There was no way the car was going to get finished on my budget. By fall of 2014, I wasn’t even sure I wanted to finish the Lexus anymore. It wasn’t worth being so stressed out about a car. I realized shortly after attending Final Bout in September I deeply regretted parting out my 240SX. If I had just stopped at the end of 2011 and left the car alone, I could have still been enjoying it. As fate would have it, I was able to buy the shell back more or less untouched and undriven since I sold it to a friend two years prior. I’ve been rebuilding and tinkering with it ever since, making some of the same mistakes I made the first time around with this chassis. If the past year has taught me anything, it is to be content and accept your shortcomings, as well as your car’s flaws. Want to know the secret to building a nice car? Know your limits and appreciate what you have. There were many things that used to cause me to lose sleep about my S13 during the first go around, all of them amounting to one key thought- it wasn’t perfect. The paint was old and covered in swirl marks, the body covered in dents. Most of the interior features no longer worked. It was loud, made lots of strange noises, and smelled funny. All of these things drove me crazy to the point that I thought I couldn’t live with them, so I gave up. After spending time away from the car, I realized that a car will never be perfect. Would I like to get my car repainted and fix all of the things that bug me about it? Absolutely! But with my third daughter being born this month, my wife will now be drastically reducing her hours at the office to be a stay-at-home mom. With me being the sole earner in the family as a graphic designer, the portion of my budget that once allowed me to spend money on this silly hobby is one of the first luxuries to be cut off. To say it’s challenging to stop browsing for parts every day and stop buying and selling things off of my car to make upgrades is a massive understatement. For me, building and getting new parts is almost more fun than driving the car itself. I’ve slowly been training myself to strictly follow a budget and stop modifying my car over the last few months, and though it is difficult, it’s also very rewarding. I now look at my car through a different set of eyes than I once did. It’s no longer about owning the rarest parts, making new changes every week to stay in the limelight, or projecting an image of perfection. When I look at the bigger picture, this car is perfect as it sits right now- it’s got just the right amount of my favorite parts that I’ve wanted for years. It fires right up each day when I drive it. Even though I don’t get to work on it or drive it nearly as much as I once did, it’s special to me each time I do. It doesn’t have flawless paint and it isn’t without its issues, but it puts a smile on my face every time I open the garage door. My kids can climb around it in or smear hand prints all over it every day without giving me a major heart attack (though I will admit, it does bum me out sometimes.) I’m so very fortunate to be able to enjoy this car while raising a family of three daughters and my primary focus from now on is to recognize this on a daily basis. When I’m out taking a photo of the car and one of my daughters jumps into the frame and busts out a big cheesy smile, I’m reminded of what matters. It’s always a good reality check to snap me back to what’s important and to keep my ego in check. With any luck, my S13 is here to stay and remain largely as it sits right now. Don’t try to be the best or have the most followers. Try not to let others dictate how you build your car or live your life. Do what you enjoy and do it well to realize your goals, but don’t get so lost in those goals that you lose sight of setting yourself up for the future. Be responsible and put your family (or future family’s) needs before your own, as difficult as that may be. Don’t beat yourself up for mistakes you’ve made in the past. Don’t take this hobby too seriously! We’re not here for that long, after all. You’re gonna have it all with the 180 this time! This means a lot dude, made me realise a few things of my own too. Really admire your attitude and how you see things. Thanks Oliver! I’m far from perfect, but this is the attitude I am trying to adopt these days. Thanks for reading! Thanks for the support Danh! The Blitz were 17×9.5 +10 215/40/17 front and 18×10.5 +20 235/40/18 rear. Too aggressive all around for my current tastes. yea it looked amazing! but i see why it lost driveability! love the build! I don’t usually leave comments on blogs but this really inspired me. Thanks for the “reality check” as you say. And also thanks for reuploading Zilvia’s thread pics, it was really helpful! (Second day reading it, I’m on page 40 :P). I know you’re probably busy with your third daughter’s birth, but if you are up to broaden your S-Chassis network across the pond, I would love to share some knowledge (probably I’ll just ask questions, not gonna lie :D) on Facebook or something. I have my RS13 200SX (now Type X kitted) since 2012 and I have seen tons of your car’s pics on the internet, but it wasn’t until now that I needed some extra inspiration that I checked your thread and blog in-depth, your car’s history is awesome man! Wow, very cool- thank you so much for the support! Feel free to drop me a line on FB Messenger sometime if you’d like. I’m glad you’re enjoying the build thread and whatnot! Appreciate it.